The Stables Cafe and Shop are located in the Coach Yard. Admission is free. Our Stables Cafe was renovated in 2018. 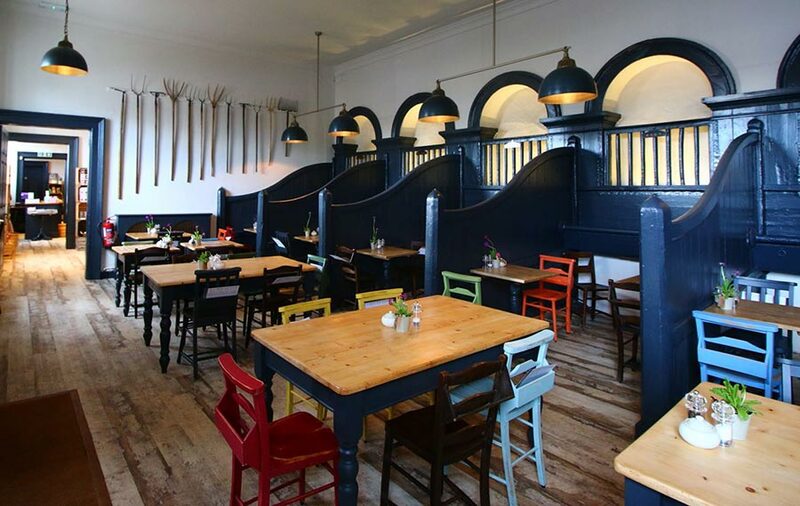 We have retained the character of the former horse stalls and updated the décor making this a stylish place to enjoy coffee, lunch and afternoon tea with friends and family. Many of the stalls still bear the name plaques of the horses that were once housed there. Our menu is regularly updated to make the most of the local seasonal produce available to us. Join us for homemade lunches and delicious cakes and afternoon teas. Our large covered outdoor seating area is perfect all year round and is fully licensed along with the Café, allowing you to sip a glass of wine while watching the bustle of activity within the Coach Yard. The Stables Shop The Stables Shop is adjacent to the Café and Coach House. It was also redesigned for 2018 and has lots of new items which have been carefully selected to offer visitors an interesting selection of gifts, homewares, confectionery, preserves, chutneys, toys and pocket money items to suit all budgets. Retail ranges change on a regular basis and include plants during the warmer months and a magical Christmas shop from November.